Within Arrow there are a variety of different methods to search for codes and data during data entry. Considerable time can be saved trying to locate codes or data once you are familiar with the various searching techniques. Shelley Lewis, Consultant at EBS, discusses these methods. This search is achieved by using the ~ key and then entering a valid code from any one of the groups below. Customer Type, Stock Category, Supplier Type, Job Type, Payroll Code, Income Codes, Expense Codes, General Ledger Account Type, Fixed Asset Types. Debtor Name, Creditor Name, Stock Description 1st and 2nd Lines, Income Code Description, Expense Code Description, Stock Code, Employee Full Name, Job Description, General Ledger Account Description, Fixed Asset Codes. For example, if you wanted to search for all the GLOSS paint stock items, the first line of stock description indicates whether it is a GLOSS, SATIN, or FLAT finish. To search for all items that had GLOSS anywhere in the description, you would enter @GLOSS then either click on the drop down box at the end of the field or press F4. A page of stock items that had GLOSS in the description would appear. Another example would be, if you wanted to search for a customer “DJ Smith”. To achieve this search, you would enter @SMITH then either click on the drop down box at the end of the field or press F4. A list of any customer with the word SMITH in the name will appear. “Transaction/Record String” searching for transactions/records that belong to a particular specific debtor or creditor can also be done using the @ symbol. This can be used in purchase orders, sales orders, debtors’ invoices, creditor’s invoices, and credit notes both in debtors and creditors. Searching for records by the postcode. You can enter characters to be included in a postcode search by using the ! character. For example, you can use !3000 in a debtor code field to see all the debtor records with the postcode of 3000. A !3000 search from the Job Code field will search for all current jobs for customer code 3000. Searching for Sales Orders by description. To search Sales orders by description, enter the ! 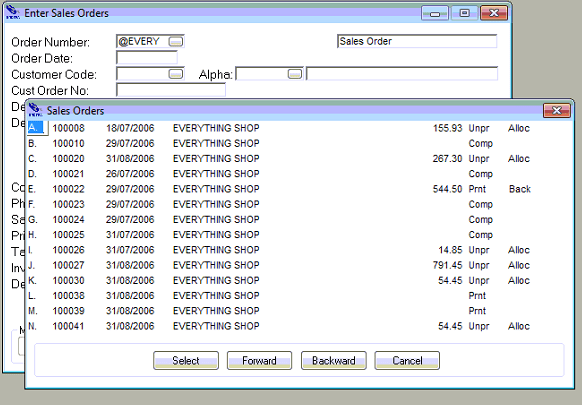 character followed by part of the sales order description then either click on the drop down box at the end of the field or press F4. Searching for records by the Phone Number. You can enter characters to be included in a Phone number search by using the & character. For example, you can use &039866 in a debtor code field to see all the debtor records with the phone number containing 039866. This search also applies to the searching of sales orders for a particular customer or customer order number. To list the records at the end of a file, you can start a search from the most recent records entered into a file. 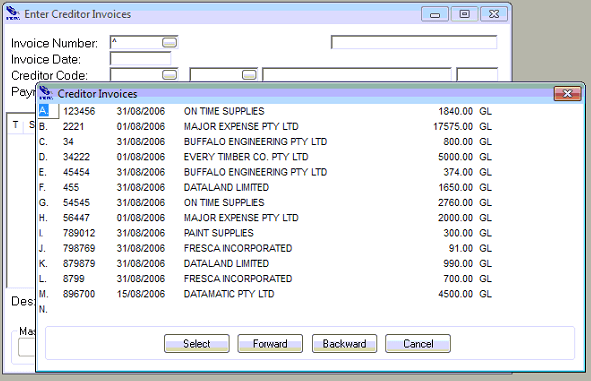 For example, if you wanted to display the last creditor invoice entered, you can type ^ in the Invoice Number screen and then either click on the drop down box at the end of the field or press F4 and the last page of invoice entries will appear. With the cursor in the Stock Code field, the following string searches can be used to locate the appropriate stock item. @XXXX Display items which contain “XXXX” in the stock description line 1 and 2. Eg. @BLUE will return all items with “blue” in the description line 1. &XXXX Display items which contain “XXXX” in the stock code. Eg. 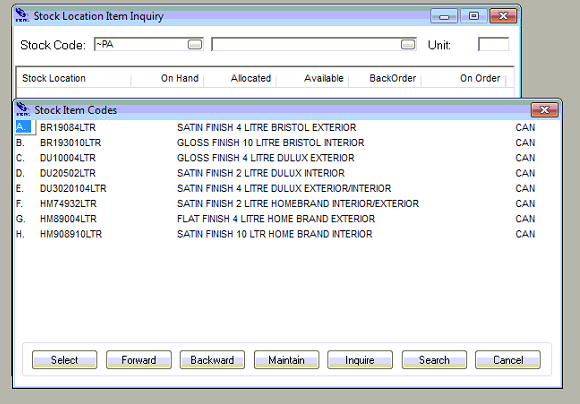 &4LTR will return all items with “4LTR” in the stock code. !XXXX Display items which contain “XXXX” in the Alternate Stock code. Eg. !CN4B will return all items with “CN4B” in the Alternate Stock Code. |XXXX Display items which contain “XXXX” in the Suppliers Stock code. Eg. |123 will return all items with “123” in the Suppliers Stock code. Once the required search and text string has been entered, either click on the drop down box at the end of the field or press F4. When entering a specific code in a screen, the DATAVIEW icon clicked twice, or the F4 key pressed twice during data entry takes you to an inquiry screen. For example, when entering a debtor’s invoice for a stock item, if the dataview icon or F4 key is clicked twice on the stock code field the stock item inquiry program will appear. Subscribe to the EBS monthly enewsletter to get the latest Microsoft Dynamics NAV, Arrow Financials news and more. EBS enews. Contact EBS to find out how we can help you achieve your business goals. Call EBS on 1300 303 973, email info@ebsys.com.au or visit our website to read more.